Donate money towards the provision of services -any amount, large or small, will help to make a difference. As a Public Benefit Organisation donors may claim donations as a tax deduction. Donors may also claim BBBEE points against the Socio-Economic Development element of the BBBEE scorecard, as HospiceWits has 76% black beneficiaries. Give a helping hand and you could WIN R20 000 every month. All it takes is a monthly commitment of R50 per membership number and you will be entered into our monthly draw. With no limit on entries, the more numbers you take, the greater your chances of winning. Either monthly debit orders or once-off annual contributions are welcome. Winners are drawn by the 10th of each month and announced via email to all members. Simply call 011 483 9175 or sign up by clicking below. Get involved today and start raising essential funds without it costing you a cent. 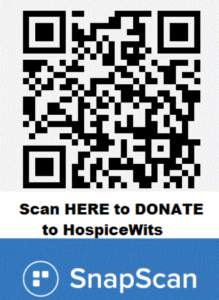 Apply for your free card today and make HospiceWits your beneficiary. Sign up and register to donate to HospiceWits. Our objective is to awaken the community to unconditional love and healing through social responsibility. By reaching out to others, we receive the greatest gift of all – the true essence of being! Just as the ocean is made up of millions of droplets, our income depends on thousands of very special gifts, each of which, no matter how big or small, makes a difference. Our Events Department runs a number of fundraising events throughout the year. The dates supplied on this website are updated regularly and events can be confirmed by contacting us via email or by calling the Marketing Department on 011 483 9148 or 011 483 9156.